Looking forward to Open Air Gampel! From Thursday 14 to Sunday 17 August you have an exciting appointment with Open Air Gampel! This music festival is mostly rock and is going to shake the beautiful Wallis mountains surrounding it. The line up may look hard rock because of the name of Marilyn Manson sticking out. However there are mostly bands which are not that hard like the Indie rock bands Jimmy Eat World and Mando Diao. Among bands which are returning to the festival like SKA-P there are also some newcomers like the British duo Royal Blood and the singer Hozier, who promise to delight the audience. 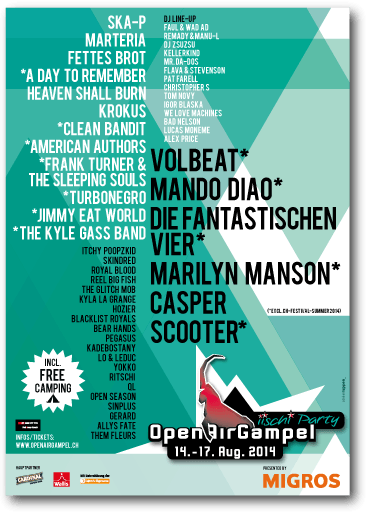 Open Air Gampel also counts quite many Swiss bands, among which Sinplus and Pegasus. Certainly a line-up and a four-day festival to look forward too! Kodaline played Gampel last year and singer Steve Garrigan, when I interviewed him in June, admitted that he couldn’t take his eyes off the beautiful scenery. So what are you waiting for? Pack your tent, sleeping bag and bring your rock soul to Gampel and be ready to be stunned and have a great party! See you there!